“Every Shot Counts,” by Mark Broadie, is a must-read golf book for everyone who picks up a golf club and hopes to improve their score. Golf is not a team sport, but rather an individual effort. Thus, using statistics to understand where you can improve is something all of us should consider. Mark Broadie offers example after example of how using statistics to improve your golf game. A professor at Columbia Business School, Broadie developed the strokes gained putting stat that was adopted by the PGA Tour in 2011. It has since become the gold standard for measuring putting performance. However, the strokes gained approach goes well beyond this single statistic to measure performance in all areas of the game. 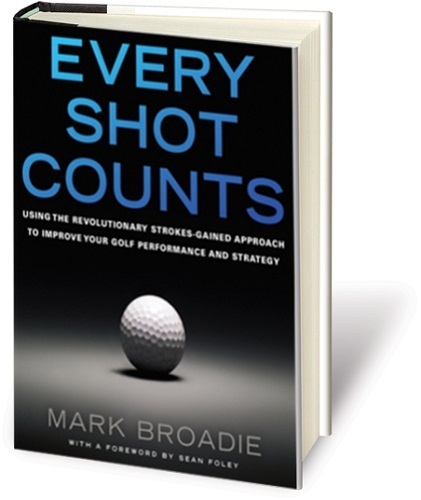 In summary, Mark Brodie’s “Every Shot Counts” offers a revolutionary scientific approach to improving your golf game. This book is for any player who wants to understand the performance or pros and amateurs, improve golf skills, and make every shot count. Publish by Gotham Books, “Every Shot Counts” is available online at Amazon or Barnes and Noble, retailing for $25.